Russia will cut off gas supplies to Ukraine if Kiev fails to pay in “three or four days,” President Vladimir Putin said, adding that this "will create a problem" for gas transit to Europe. He noted that Russia’s ministers and the CEO of Gazprom have “actively” reminded Ukraine of the looming deadline. On Tuesday, Gazprom's CEO Aleksey Miller reminded Ukraine’s state-owned Naftogaz of the gas prepayment. Miller said that Ukraine had not paid for March deliveries and warned that Kiev was risking an early termination of the advance settlement and a supply cutoff. "It takes about two days to get payment from Naftogaz deposited to a Gazprom account. That's why a delivery to Ukraine of 114 million cubic meters will lead to a complete termination of Russian gas supplies as early as in two days, which creates serious risks for the transit to Europe,” Miller said. Putin said that Gazprom had breached no contract terms of gas supplies to border points to eastern parts of Ukraine. "It has become known to us that Kiev suspended gas supplies [to Lugansk and Donetsk regions] referring to the alleged damage to gas pipelines," Putin said. "At the same time, Gazprom is fulfilling the contract signed back in 2009 and an addendum to it made in October last year. In full compliance with this contract, it supplies gas to Ukraine under advance payments made for the volumes, which Ukraine needs." Putin indicated that these contracts also stipulated border points. "Gazprom is not breaching any provisions," he added. "As for the damage to the gas pipeline, I don't know for certain, but I know that these regions are home to about 4.5 million people. Just imagine that these people may be left without gas supply during the winter period. 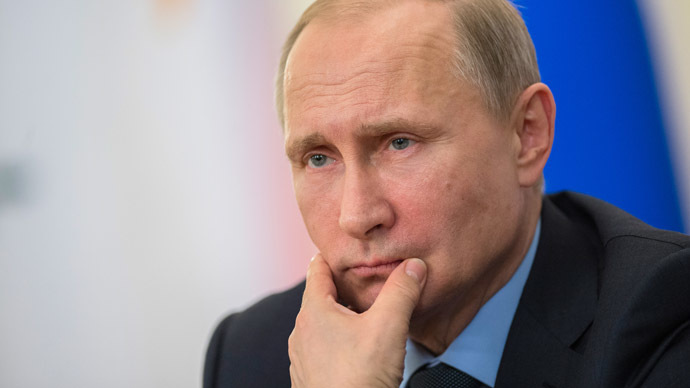 In addition to the hunger, there as is already stated by the OSCE and the humanitarian disaster, just imagine these people may also be left without gas supply," Putin said. He accused some Ukrainian officials of failing to understand the humanitarian issues in Ukraine’s eastern regions. Ukraine’s state-owned Naftogaz suspended gas supplies to eastern regions on February 19, citing damage to a pipeline. Under the gas deal between Moscow and Kiev, Gazprom promptly launched gas supplies to Ukraine’s southeast through border gas metering stations supplying 12 million cubic meters a day. Kiev said it restored the damage in several hours and restarted gas supplies. Naztogas has refused to pay Gazprom for the gas supplied to eastern regions from February 19. The same day, Russian Prime Minister Dmitry Medvedev ordered the country’s energy minister and the head of Gazprom to prepare proposals on fuel deliveries to Ukraine’s southeast regions. Naftogaz has also accused Russia of breaking the agreement to deliver 114 million of cubic meters of natural gas to Ukraine by delivering only 47 million cubic meters. According to Naftogaz, since February 22 Gazprom has been fulfilling only 40 percent of its requests for pre-paid gas, yet the Ukrainian company plans to get 206 million cubic meters of pre-paid gas by the end of February, RIA-Novosti reported Wednesday.